L to R: Jillian Svonavec, Jessica Martin, Alexandra Mecs, Angela Isaac, Ph.D., and Patrick Mulvihill, D.Ed. 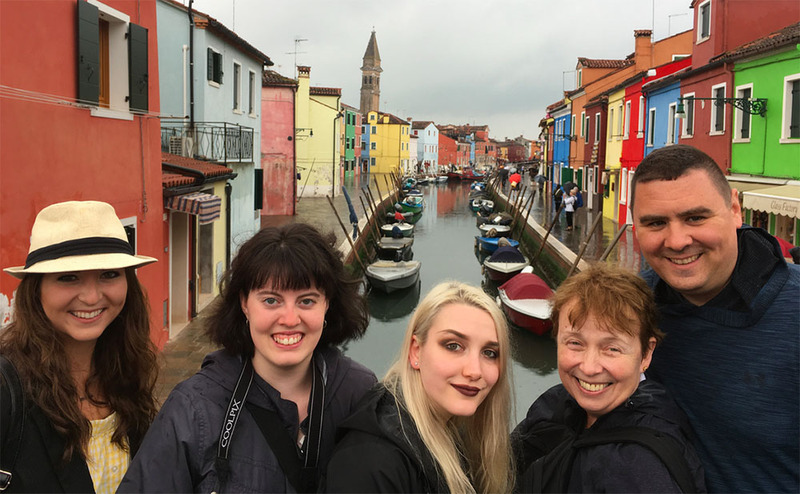 Rowland School of Business students Jessica Martin, Alexandra Mecs and Jillian Svonavec, along with Professors Patrick Mulvihill, D.Ed., and Angela Isaac, Ph.D., traveled by train throughout Italy experiencing life and culture in Milan, Venice, Murano, Burano, Florence, Pisa and Rome. “This was an affordable and fast-paced trip that allowed us to gain knowledge about other cultures and have a study abroad experience,” said Jillian Svonavec, a junior SAEM major from Somerset Area High School in Somerset, Pa.
“Every day brought something new and thrilling that created memories I will always cherish,” added Svonavec, who focused her research on how businesses survive and overcome international communication barriers. Alexandra Mecs, an SAEM 2018 graduate from Upper St. Clair High School in Pittsburgh, studied the music scene in Italy. “What I observed was that Italy does have its own thriving music scene, but American musicians are equally as popular (if not more so) than Italian musicians. Perhaps one day, my work in the SAEM field will lead me back to Italy and its music scene,” Mecs said. Jessica Martin, an M.B.A. student concentrating in business analytics from Brentwood High School in Pittsburgh, continued her research on the similarities and differences between American football and European football (soccer) that she conducted on the business study abroad trip to Madrid last year. “This year my goal was the same, except I went deeper as a graduate student by interviewing and surveying others regarding my thesis. 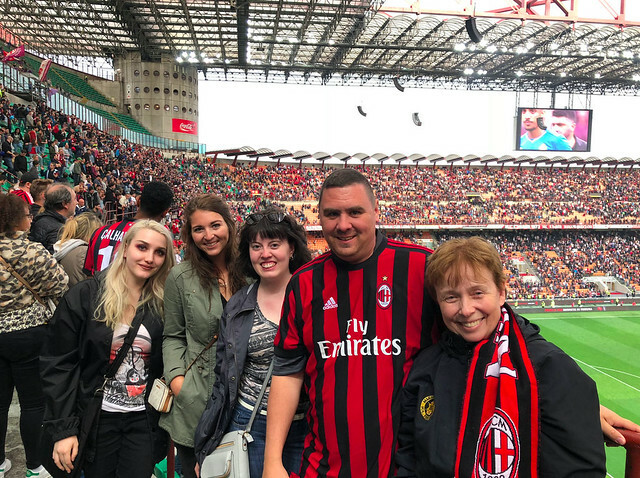 Last year, I attended a Real Madrid game and this year, our group attended the final AC Milan game of the season. Our main tour guide Stefano was from Italy, and we had another tour guide in training from Spain, so it worked out perfectly for my project!” Martin said. During the trip, the Point Park group joined a larger group of people from around the world to tour Italy. “Though it was important to ensure our students experienced the many historical and cultural highlights of Italy, they also had the opportunity to immerse themselves within the local culture during their time abroad. The time we spent off the beaten path truly illuminated how welcoming and genuine this region of our world is,” explained Mulvihill. He added: “It is my hope that these experiences will have a lasting impact on the students as they move forward on their professional journeys." Explore the undergraduate and graduate programs in the Rowland School of Business and learn more about Point Park University's study abroad opportunities.